This post continues my discussion of the mythology of May Day, along a less familiar tangent. We’ve all heard of Maypoles, but what about May Day bonfires? Traditionally, in most countries of northern Europe the May Day bonfire ritual was at least as important as the Maypole ritual. Generally speaking, the bonfires were more important to pastoralists dependent on their herds of cattle and sheep that were about to be let out to their summer pastures, while the Maypoles and their associated rituals were more meaningful to farmers’ newly sprouting crops; but these two kinds of rituals were usually combined in one May Day celebration. Today I cover bonfires, and will discuss the mythology of Maypole rituals in the next post. May 1 is a perilous but ultimately optimistic moment of transition from the old to the new, from the winter to the summer season. Whereas vernal equinox holidays celebrate the anticipated victory of spring and fertility, May Day, being halfway between the equinox and the summer solstice when the sun’s waxing light and warmth is more clearly felt, celebrates and guarantees the full blown forces of summer (which according to the Celtic calendar indeed began on May 1). At this point winter is finally defeated and left behind, as symbolized in rituals such as the one I discussed in yesterday’s post about the May Queen defeating the Queen of Winter. This transformation process also entails other rituals of cleansing and renewal, for which task fire is perfectly suited. Generally in mythology, fire is a purifying and cleansing agent, which enables it to destroy the causes and manifestations of evil. Fire is therefore an agent of transformation. The sun is thought to be made of fire, meaning that fire on earth is just a lesser manifestation and representation of the same solar substance, which is divine by nature. Of the traditional four ancient essential elements, fire was the only one which humans could participate in creating, which connected them to the divine. Building a fire on earth could be both a process of sympathetic magic designed to ensure the supply of light and heat from the sun and stimulate the growth of crops, as well as an apotropaic rite to ward off evil and protect people, livestock, and crops. Thus, at least as far back as the ancient Near East, fire was used in incantations to counteract evil spells and annihilate sorcery. The ancient Greeks too had a ritual of running over hot coals (pyrobasia), which appears to have originated as a springtime purification ritual like those described below. The most relevant springtime fire ritual in the Classical world, however, was that of the Parilia festival in Rome. 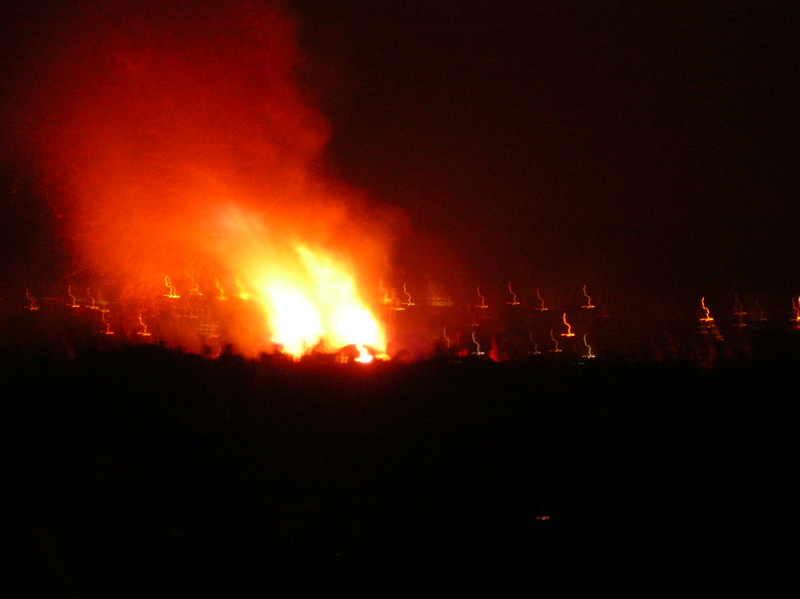 In medieval Europe forward, similar May Day bonfire rituals were observed both in northern continental Europe and the British Isles, with the Gaelic Beltane bonfires in Scotland, Ireland, Wales, and the Isle of Man being the most emblematic. The word “Beltane” is a combination means “bright fire,” “Bel” being derived from Biel (or Bel), a god of fire and purification. His name is probably not a corruption of “Baal” in the Hebrew Bible, as one often hears, since the word is not Semitic but ultimately derives from the Proto-Indo-European root *bhel, meaning to shine, flash, or burn. People thought that on May Eve (April 30), witches and evil spirits were generating their evil plans for the people, livestock, and newly planted crops, so that is when the bonfires were lit and rituals were performed to counteract this evil. The process began when all hearth fires and candles in people’s homes were put out, so that the village bonfire could then be generated. Typically, the bonfire was started by the most primitive means possible, by rubbing two wooden sticks together (or by plank and wimble) to produce sparks emanating from the wood. (The rubbing also had sexual overtones.) Starting the bonfire with wood in this way made it most holy, and at the moment it was the only fire in the land. After the festival was over at sunset on May 1, the people took embers from the bonfire to re-start their hearth fires at home, and the ashes from the bonfire were scattered over the newly sprouting crops. The bonfire ritual was followed by sending youths of both genders into the woods all night. Romance was in the air, but the youths also would gather flowers, boughs of newly flowering hawthorn or blackthorn, and a tree trunk for the Maypole to be erected the next day. I will describe these festivities in my next post tomorrow. These days the May Eve bonfire rituals are celebrated by neopagans and others in several festivals around the world. The most important is the Beltane Fire Festival held in Edinburgh, now a tourist attraction to which anyone can buy tickets. This entry was posted in Holidays, Mythic Travel, Mythology and tagged Beltane, bonfire, edinburgh, fire, May Day, Maypole, Ovid, Parilia. Bookmark the permalink. read through a single thing like that before. So good to discover another person with a few unique thoughts on this subject.